Since I am still always cold even in the warmer months, I have a closet full of all different types of jackets. Spring and summer jackets are the best because they are always so easy to wear with just a simple cami/tee underneath and instantly make the outfit (let's be honest, jackets always make the outfit). This tweed number I grabbed recently with a gift card I was holding onto from the holidays is absolutely THE quintessential spring jacket. It's great for an office environment or casual with jeans and sandals. I also plan on styling this with cut-offs and slides for the summer! 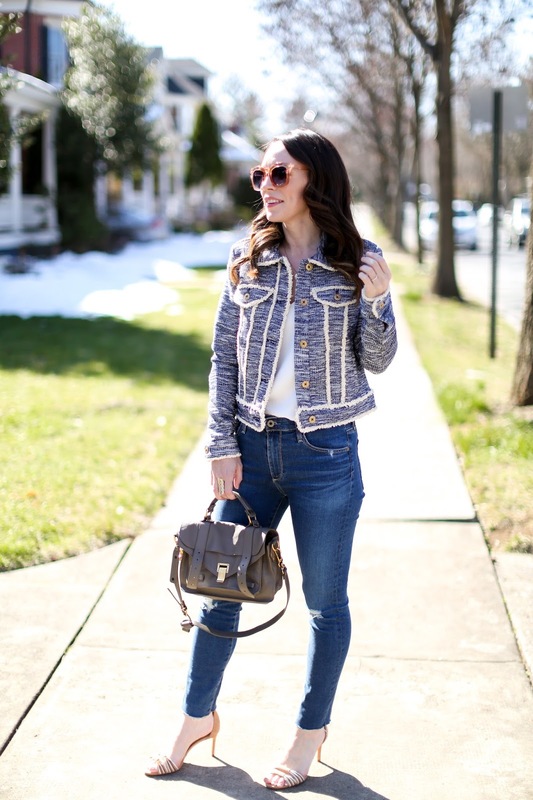 For more spring jacket ideas, scroll through the widget below - Anthropologie has great ones right now. But if jackets aren't your thing, they have the most beautiful kimonos - this, this and this are ones not to miss!